Providing solutions doesn’t stop with our products. At NASHCO we ensure that we get our product to you when you need it, how you need it, and where you need it. We cover the Canberra Metropolitan area twice daily. You have the access to Free Crane Truck delivery when required and same day dispatch. Orders placed by 11:00am can be delivered that afternoon and orders placed by 3:00pm can be delivered the next morning. 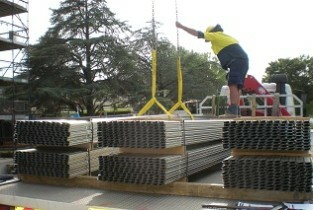 Free delivery is offered in the Canberra Metropolitan area for orders valued over $400 ex gst. These deliveries are included in the morning and afternoon delivery schedules. Decreasing your downtime! We offer a service for when you have workers on site without product! This service is a chargeable premium service when you need products faster than our Standard Service will deliver. We offer a range of solutions tailored to your requirements including, special packing for multistory crane unloading, crane truck delivery, pack labeling, small vehicle delivery, and much more. Discuss your requirements with us today! Our transport network services all major cities in Australia. Materials are packaged in open top or curtain side containers depending on the unloading requirements.